When I saw the MFA exhibit at the School of the Art Institute in May, the piece that I found most moving was a sculpture, or rather the shadow cast by a sculpture. 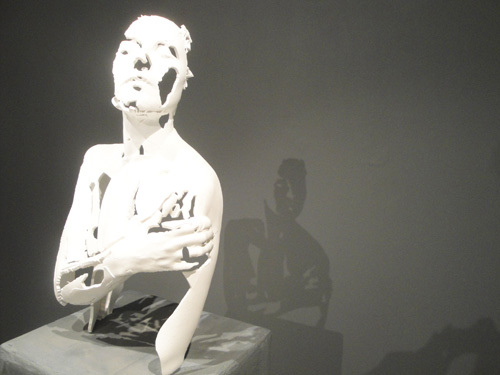 The sculpture itself, the bust of a woman, was fragmented. It wasn’t clear whether she was in the act of becoming or was being shredded to disintegration. But in the shadow cast on the wall, she was whole. 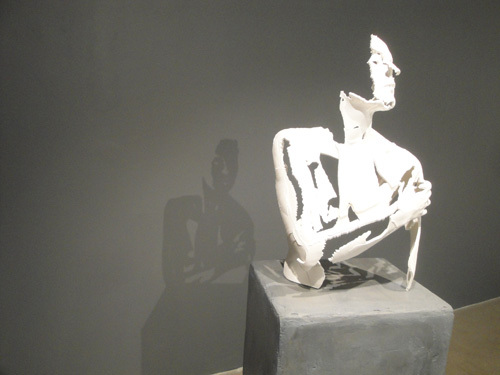 It seemed to me that the work was not about a piece created by strips of white clay, but about the shadow. It seemed obvious to me that the artist, Sophie Kahn, was working with light. Her medium was not clay at all, but light and shadow. People who only saw the raggedy clay forms were missing the point. Look! The shadow! 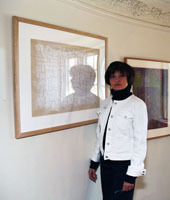 That’s where we have the art—the life of this piece is in the shadow! How did she create this effect? I imagined her sculpting with a certain light source precisely placed on one side of her sculpting stand and a wall precisely distanced on the other side. Then, for the installation in this gallery, she had to precisely duplicate these distances and angles. A daunting task. And for what? To create a shadow! Those lines are wafting through my brain whenever I contemplate art. Add to that the fact that in May when I was looking at this sculpture-shadow, I was reading “A Short History of the Shadow” by Victor Stoichita.